We all are faced with challenges from others. Everyone has expectations of what we should be. Often it is to satisfy their own needs. People want us to run faster, work harder, contribute more. Most of it focused on short term objectives, on what they can get out of today if only they could get more out of you. Every single day of your life, you are faced challenges. There is another voice that challenges you. This is our inside voice. This voice says “I could go for a run” or “I could ride my bike today instead of driving”. This voice uses the word could because it sees the potential in you. I’ll talk about the difference between could and should in another article. Today, I want to talk about the decision point when we hear this request for improvement from our inner voice. When we make excuses (I can’t do this because…), it rejects this positive spirit so it wants to speak up less and less. 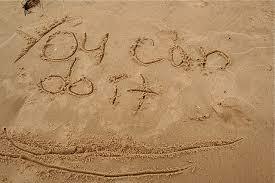 When we say “Yes I can” and take action it fans this inner flame so it grows stronger and stronger. they got to be so motivated. Look closer and you will see how alive and strong their inner voice has become. You will be faced with a challenging decision today. It might be to go running. I invite you to put your running shoes on and walk to the corner. See how you feel then. Taking the first step is the hardest and if we can start down a path, it’s easier to continue. If we can build up a cadence of saying yes to our own improvement, we gather momentum, we gather an inertia of will positive will power. Challenge yourself to find a way to make it work. You can do stretches anywhere, take the stairs, swap dessert for a healthier treat, carry something for a neighbour, or spend a few minutes meditating. You can do it. You can make that small change that you want to. It is within your reach. HumanRefactoring is about small, incremental improvements to your life. I believe you can make one today. What do you believe?